It's Pie And Beer (And Pioneer) Day In Utah! : The Two-Way Friday honors the arrival of Mormon settlers at Salt Lake Valley in 1847 while non-Mormons celebrate Pie and Beer Day. Thirty-seven other states also celebrate these unique holidays. A statue of Mormon pioneer leader Brigham Young at The Church of Jesus Christ of Latter-day Saints' Temple in Salt Lake City. 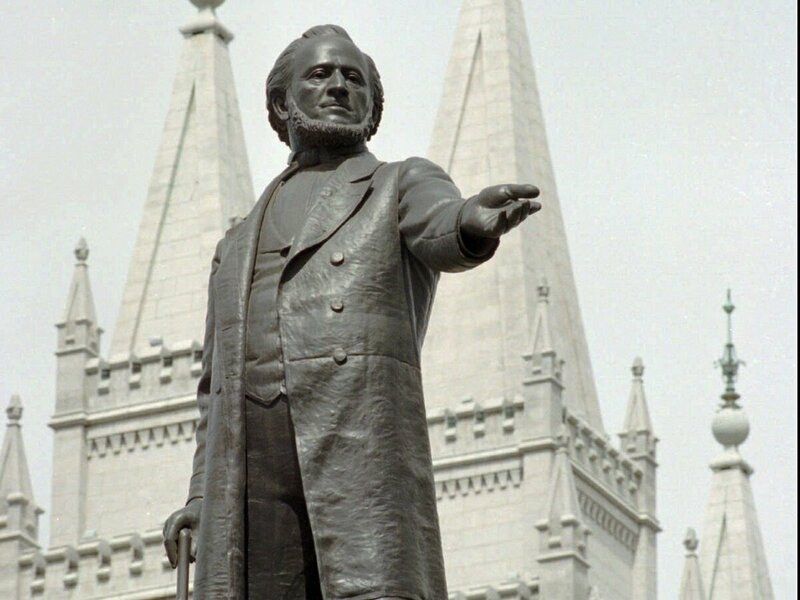 July 24 is Pioneer Day in Utah, honoring the arrival of Brigham Young and other Mormon settlers at Salt Lake Valley in 1847. State offices and banks are closed, employees have the day off, and there are parades and fireworks throughout the state. Non-Mormons in Utah celebrate the day a little differently — as Pie and Beer Day. Breweries and bakeries team up to serve baked goods and craft beer to spend the religious holiday in a secular way. But what about the other 49 states? About 38 states celebrate 40 holidays unique to their state or region, made law from passage in a state's legislature, some celebrating a hero, a battle, or even a king. In a less than a month, the state of Rhode Island will be celebrating Victory Day (Aug. 10), which marks the anniversary of the Allies' victory over Japan during World War II, and Aug. 27 is dedicated to Lyndon B. Johnson in Texas. Some are even celebrated nationwide, like Louisiana's Mardi Gras, held every year the Tuesday before Ash Wednesday. And several communities plant trees for Arbor Day on the last Friday in April, but only in Nebraska is it a legal holiday. States even have days dedicated to their own statehood. Alaska has two days related to its status in the union: Seward's Day, which marks the day U.S. Secretary of State William H. Seward signed the Alaska Purchase Treaty in March of 1867, making official the trade of Alaska from Russia. Alaska Day, on the other hand, marks the formal transfer of the state six months after that on Oct. 18. Other holidays devoted to individuals include Hawaii's King Kamehameha I Day, celebrated on June 11 to honor the state's first king. Arkansas celebrates civil rights activist Daisy Gatson Bates on the same day as George Washington's Birthday. Susan B. Anthony is honored in Florida every year on her birthday. A bill to dedicate a day nationally for the women's rights activist was introduced in the U.S. House of Representatives in 2011, but failed to move forward. A few established holidays have been contested over the years, including Robert E. Lee Day and two other Civil War-related days, Confederate Memorial Day and Jefferson Davis' Birthday. The former is celebrated by six states, and the one-time president of the Confederacy is celebrated in two states. And even though their existence is questioned, each holiday continues. General Lee's Day is a legal holiday in eight states, and his day falls on Dr. Martin Luther King Jr.'s Day in seven of them. The irony of the situation is not lost on the public, most recently in Arkansas. But for today, the biggest holiday controversy in Utah might be choosing between apple and blueberry. Happy Pie and Beer and Pioneer Day!